19696654? Must be the phone number. There wheelchairs to wheel in all their customers. 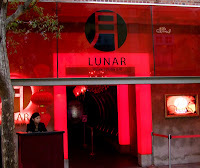 The Lunar must be a Chinese Restaurant, or is it another dancing hall? No it is an Asian fusion bar. Her it is free entry for ladies!